Houses & Homes VA: Do you know the REAL reason we call it “Black” Friday? Do you know the REAL reason we call it “Black” Friday? Although we’re all familiar with the term Black Friday most people don’t understand where this strange name originated. Why would we call the most important shopping day of the year “Black? Why not something more positive such as “Super Friday” or “Savings Friday”? To understand how we arrived at this term you must know a bit about history! The term Black Friday was originally coined on Sept. 24, 1869, 145 years ago. At that time the expression was used by numerous important persons in the financial world to describe the depression that was caused when certain investors tried to “corner” the gold market with disastrous results for the economy. In 1873, again on a Friday, the term was used during another major scare in the financial markets. So how did such a term become synonymous with finding the greatest shopping deals of the year? Well, we can thank Mr. Earl Apfelbaum, a rare stamp dealer in Philadelphia for this dubious distinction! 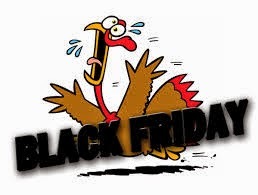 In a local advertisement he stated that the Philadelphia Police Department referred to this day as “Black Friday” due to the huge amounts of traffic and sometimes violence that they needed to contend with as a result of the massive numbers of people involved. The term caught on quickly and soon everyone was using it to refer to the 1st Friday after Thanksgiving. As you might imagine, retailers did not appreciate the negative connotations of the term and decided to do something about it! In an effort to change the image of the term “Black Friday” retailers decided to do something quite unusual. They decided to portray the term to reflect their success as a result of the day versus its original meaning. In advertising and commercials throughout the nation the largest retailers “reeducated” the public by explaining that “being in the black” means that a business is making a profit versus losing money or being “in the red”. Thus, “Black Friday” became a “good” thing! It became the most important day of the year economically for retailers and helped to ensure that retail businesses succeeded and everyone could keep their jobs for another year. It was truly one of the most successful business advertising campaigns in history and today we still see its results. Happy shopping!